…..but then again, it is always busy around here. …..pulling out some “treasures” hidden in cabinets. These Yellow Ware bowls belonged to my late mother-in-law. 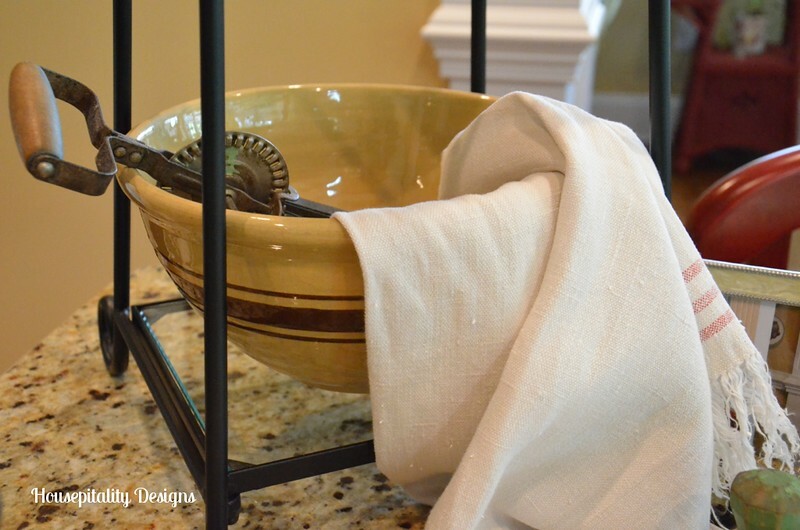 I displayed the set on a 3-tiered iron display stand that I purchased years ago…. …..from those Southern Living home parties. 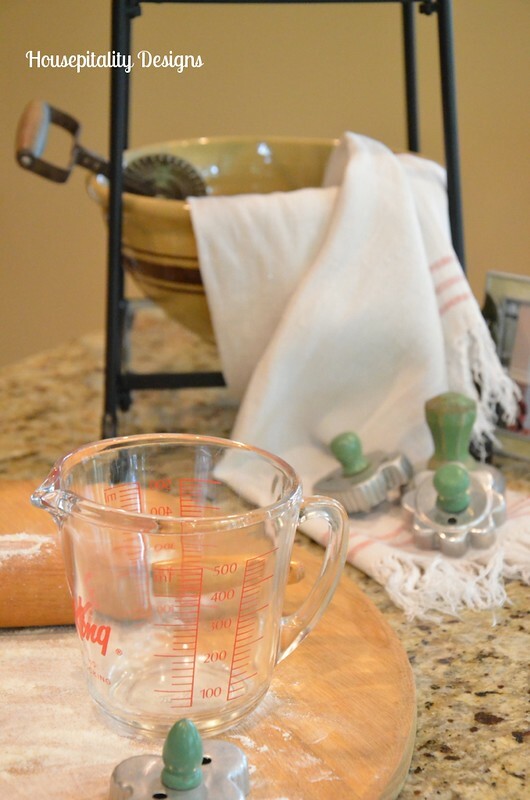 …..for a little cutie to use them to make cookies. I remember how much fun it was baking cookies with my mom. …..as I will hold on to those memories forever. Memories of more flour being on us than in the cookie dough..
Or wondering which cookie cutter design will be the prettiest. …..is definitely just as good, as smelling the fragrance of roses. I loved making cookies with my grandson, too. Now he wants to make them himself, but he still serves them with a smile. OMG, those cookie cutters are just like the ones my grandmother used, too. I would love to find some of those. 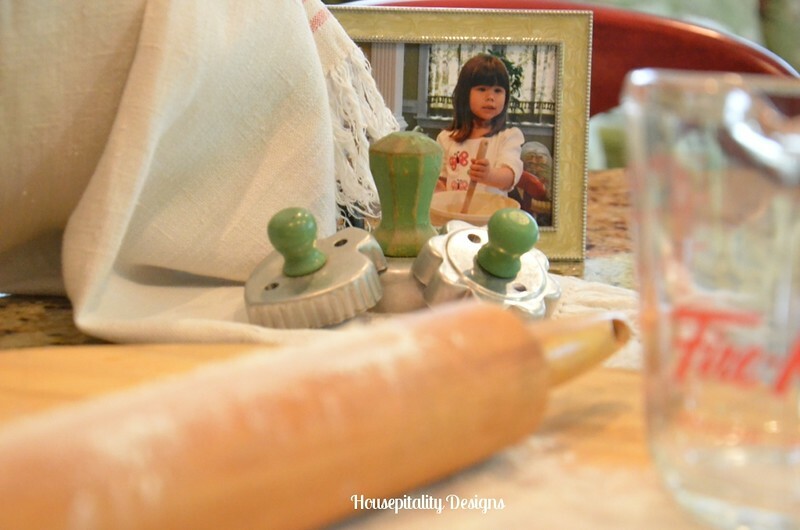 I look forward to making cookies and memories with my grands, too. Angela’s recent post…Fall Front Porch “Wreaths”! I have a pic of my now 20 yr old granddaughter making cookies in my kitchen……great memories! Grandmas need to take time to do these things! Oh the treasures are wonderful Shirley. 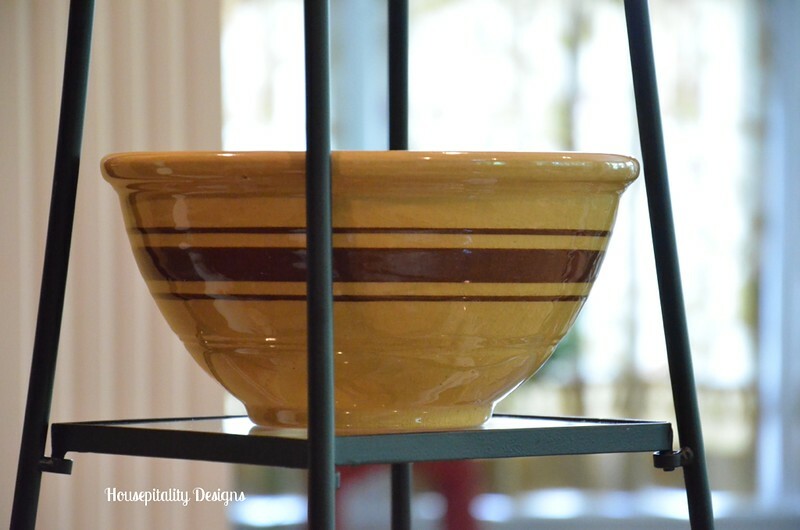 I love the yellow ware bowls and the stand is perfect for them. How sweet! Your kitchen is so pretty and you are making wonderful memories. I just loved baking with my boys. I can just picture my oldest sitting on the kitchen counter helping me ice cookies. What a precious story! I love the photos too! I can smell the cookie dough from here! Lovely post! Shirley, those bowls are indeed a treasure and so is that sweet granddaughter. She will have so many beautiful memories of time spent with you! Love your message-take time to smell the cookie dough! You need to create a printable of that! It is always the simple things that create the best memories. Shirley I adore those bowls. 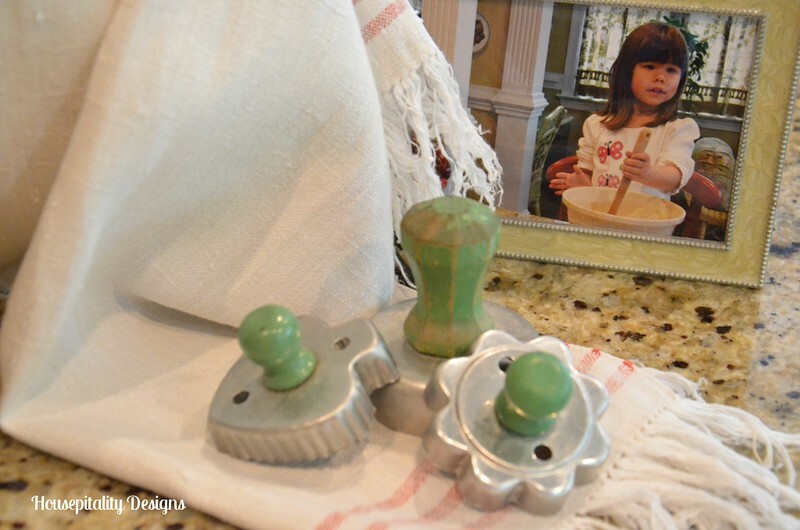 I have so many memories of making cookies and baking with my mother. I cherish every single one of them. I remember she would let me do all the dry ingredients when I was small. Then I graduated to the mixer too. It is so special that you want to make these memories with your granddaughter. She will be right there to help I am sure. Your treasures are wonderful and this was such a beautiful post. Just enjoy every moment! The bowls are lovely, and I like the way you displayed them. The flour dost fly when I make cookies with my 5 gkids! Chaos! Until we bought our house in Maine, we had a place in Galveston that lent itself to vintage decor. I loved yelloware and it was perfect there. Now, my collection of bowls sits in a cabinet because they just don’t fit Houston or Maine. Very now and then I take them out just to look! What a pretty post. Great pictures, lovely treasures and wonderful thoughts. Time spent with grandchildren is time well spent. Very sweet post Shirley, and the cookie cutters are precious! Love, love, love, your yellow ware bowls. Love that you are using the vintage cookie cutters. I have the same ones! What a little cutie your granddaughter is. She reminds me of my Kelly when she was that age, will be 11 in October. 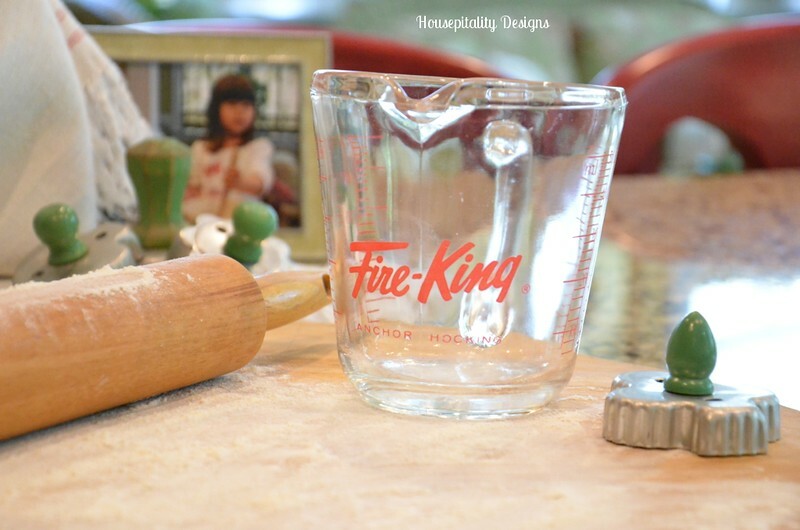 Love your bowls, cookie cutters and rolling pin – I know you have wonderful memories with them. Shirley, what a sweet post. Love the bowls, egg beater and the stand. I especially love the photo of that sweetie. Your photographs are absolutely fabulous. Savannah Granny’s recent post…REMEMBERING YOSEMITE! Oh Shirley! So glad that y’all had a great time making cookies. I’m so ready to see my grands. What a sweet vignette, Shirley! And the picture of your sweet granddaughter is the perfect accent! 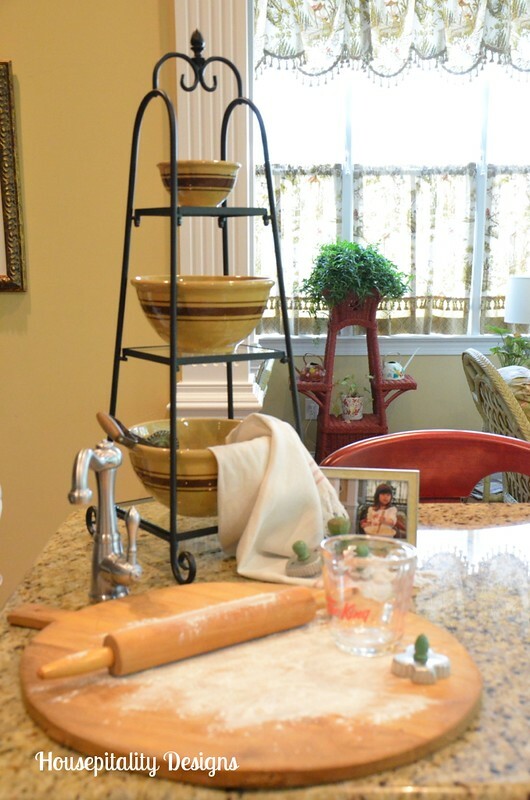 Love those vintage bowls and how you displayed them on the tiered stand. The vintage beater is perfect! I love all of your vintage collectibles! 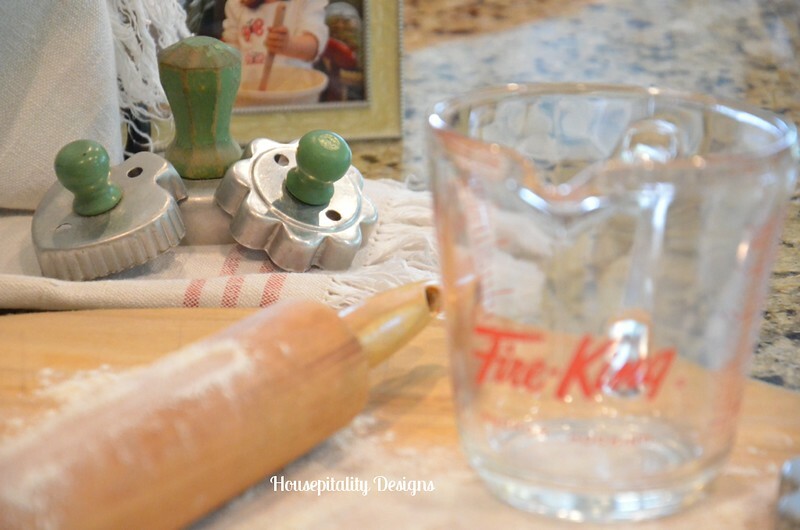 Your vintage bakeware is wonderful….great memories here! Beautiful post, Shirley! 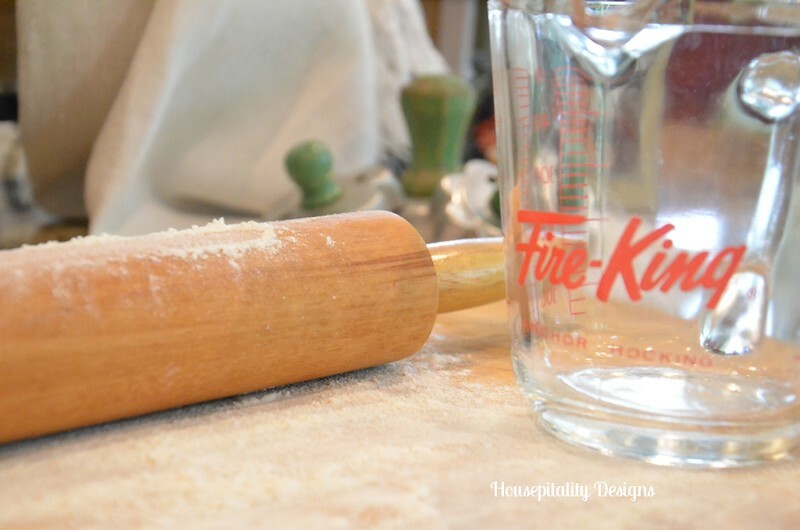 LOVE all the special kitchen items that bring back happy memories. Your granddaughter’s picture is precious! I also remember days of baking with Mother! When we made sugar cookies, the leftover dough of the circle cutouts were ours to sprinkle with cinnamon and sugar to bake! Thanks for linking at Let’s Dish, SHirley! Making cookies through the years with my mom and grandmother are some of my fondest memories. For that reason, I still love to make cutout cookies. This is a wonderful post, Shirley. 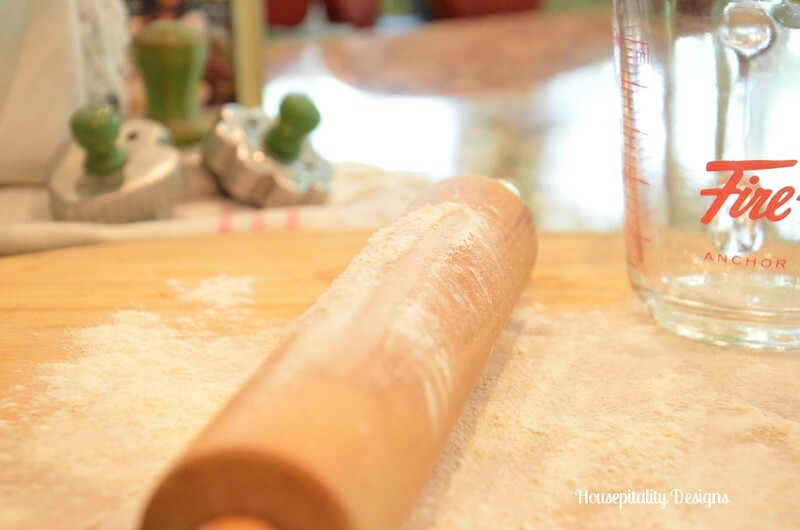 Your bowls, cutters, and rolling pin are beautiful family treasures. Enjoy your time with that precious grandchild. Those are all great little treasures Shirley! Thanx for sharing them with us at THT! Can not wait to hear all about your trip!